Simon Laurens started riding at the age of 8. In 2004, at the age of 36, Simon was diagnosed with Multiple Sclerosis. 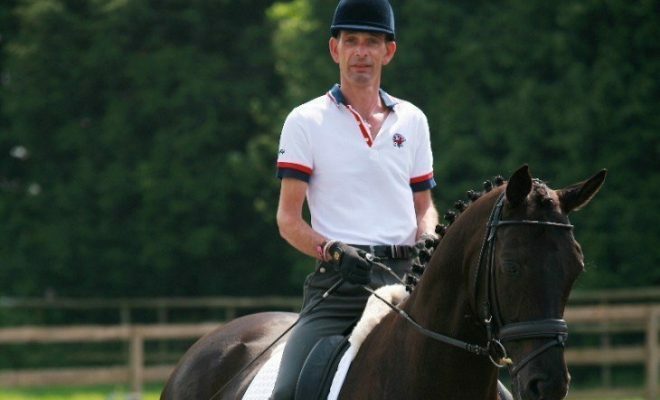 Within two years he began competing for Great Britain on the Para-dressage team. 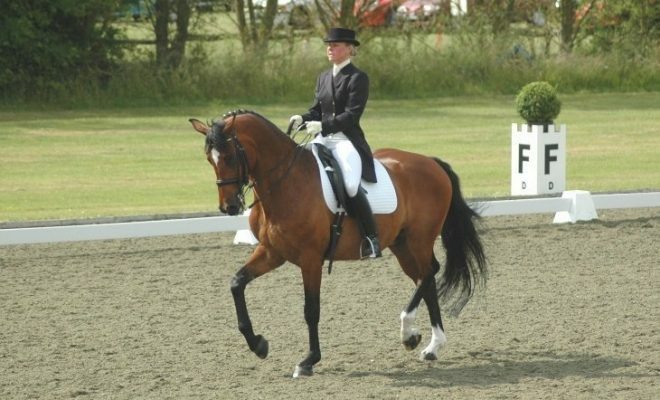 He won the National Grade III Disabled Dressage title in 2006 and 2007 and also won both team and individual freestyle golds at the 2007 World Para-Championships. Selected to compete in his first Para-Olympic Games in 2008 in Beijing, Laurens entered the individual freestyle test grade III and was part of the Great Britain quartet for the overall team championship. Competing on his own horse Ocean Diamond, he won a silver medal in the individual event and won a gold medal in the team open. Okay so today we have Simon Laurens, thank you so much for joining me today. For those people that are listening, Simon has been booked in to do a podcast, I think, about four or five times now, but we just haven’t managed to pin him down! He’s a very, very busy man, so really excited to have pinned him down to do this interview, so welcome to the podcast Simon, how are you today? I’m very well, thank you very much. Crikey, we’re finally getting together! I know, it’s like a long date that we’ve been planning for a long time, that just hasn’t happened. To kick off this interview, we always like to start a little bit different. We’d like you to tell us an interesting fact about yourself. Maybe something that most people wouldn’t know about you. Now it doesn’t have to be horsey related, just something interestingly weird about you. Oh my gosh. An interesting fact? Okay, here is something quite weird and this isn’t actually on the British Dressage website, because they asked me not to put it on – not that there’s anything wrong with it – but I actually used to be a cage dancer. Oh, that’s fantastic. I used to have a pole dancing business, so it’s fine, we’re in the same boat. Did you? Do you know that’s one of the things I want to do this winter, is learn to pole dance. Oh, you should. You’ll get bruises everywhere though. That’s fantastic. Not weird, crack on. That’s unusual, isn’t it? I guess there’s not many dressage riders or judges that have been cage dancers I suspect. No, I think you are in the minority there, Si. I think I possibly am. Oh fantastic, I think that’s brilliant. Okay. Give us a small insight into your personal life; so, where are you living at the moment? Do you have any horses at the moment and what’s a typical day look like to you? Okay, so I was born in Jersey, the biggest of the Channel Islands, I think Carl Hester was born on Sark, which is the smallest one of the Channel Islands, so that gives you a little idea of where I came from. 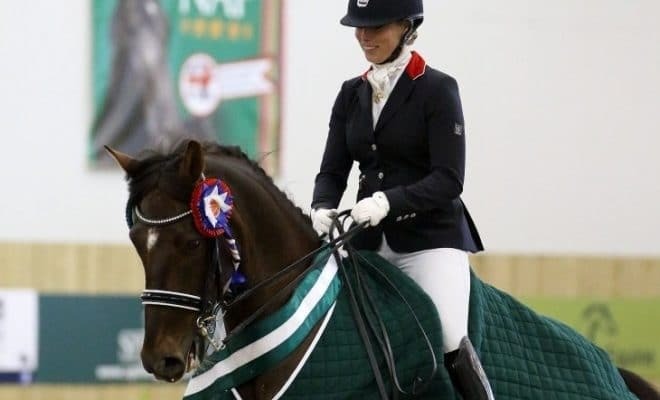 I’ve been living in Gloucestershire which is my home now, just outside Cheltenham, since 2007 and I moved here with my partner, basically because I couldn’t compete any longer in Jersey. There’s no real competition structure, we have five shows a year and that’s it, but nothing major, so I came here, and I moved full time in 2007 to do the World Championships, but prior to that, I’d been competing here since 2005. That is the first time I really started doing dressage. Do you still compete? I think you’re retired at the moment, aren’t you? At the moment, yes. 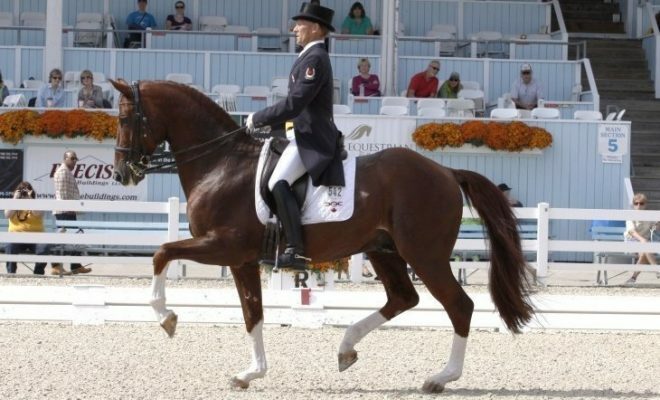 That is the beauty of dressage isn’t it, because you can be of any age. The reality of it is there is no real age limit on it. I retired in 2010 after the European Championships which was kind of my swan song I suppose. I was very lucky, I did really, really good years, and so I did the Para Games and the World Championships and the Europeans and then I decided to retire for several different reasons, but it’s always good to quit at the top, isn’t it? Don’t you think? Oh definitely, definitely, go out with a bang as they say. Do you have any horses at the moment? Do you still ride or are you just teaching? I don’t ride at all. I ride a few client’s horses every now and then if it’s being a bit tricky. And I have still got my horse that I took to the Games, Derrick, he’s with a very lovely lady called Mary over in Northampton and she just hacks him around and has fun on him and generally enjoys him, so he’s in pretty much retirement if you like. That’s it. Yes, just ticking over. I went to see him actually last week, which was the first time that I’d seen him for a year because I’d found it quite difficult. When I retired in what would be technically January 2011, I literally rode him that morning on January the 1st and I just said to Henrietta – Henrietta in Ulrich where I kept the horse – that that would be it. I would never ride him again and I never have. Never sat on him since. Would a little part of you like to or…? I’ll never get back on him again. That was part of the deal I made with myself. I am quite an odd person, as in when I got into this dressage malarkey, it was going to be the case of do it, no matter what, and do it to the best of my ability, and I’m exactly the same when I finish something. I needed to make a clean break and that was the only way that I could really do it. If I can’t do it the way I want to do it or how I want to do it, then I just won’t do it. I am quite like that and I’m quite stubborn about things like that. The decision was that I would never ride him again, I would never go out with him ever. You could offer me all the money in the world, and we did get offered a lot of money when I retired, but I refused point blank. I’ll never sit on him again. But he has a lovely time with Mary and she hacks about and does a bit of very low-key stuff on him and enjoys him. Yes, which is what horses are for really aren’t they? As long as he’s happy and healthy. Gosh, he’s done his bit. He’s won 11 medals for his country if you like, for want of a better expression. He’s entered retirement, and our retirement was slightly different because it wasn’t necessarily what I wanted to do, I didn’t necessarily want to retire, but sometimes the circumstances put you in a position where you have to make a choice. Sometimes you have to think with your head, instead of the heart, which I’m not very good at. I had to make a decision then as to what I was going to do. I’ve got MS, but my partner has got Parkinson’s, so I had to make a decision of what we were going to do and we fell foul of the dreaded 2008, the credit crunch, so things got very difficult for several years and we’re just starting to get back on track now. Things have been really tricky. This dressage hobby’s quite expensive. It is. You know I would never lie to anybody. It’s not, it’s not a cheap fix. It is not a cheap fix by any stretch of the imagination. I’ve done it at what I consider to be a really good level, for me, because I make no bones about it, I was very lucky. I had a very good horse and if I’m really, really honest, I was just a very average, average rider, who happened to be in the right place at the right time, with the right piece of machinery. That was it. If I’d been doing this able-bodied, which sounds really terrible now doesn’t it, gosh you’re getting the whole lot now, if I was able-bodied, I’d be really average. I’d be really ordinary, I would. Doing the Para thing put me on a level playing field, so to speak, so it gave me the opportunity to do something as good as I could possibly do it and go to places I would never have imagined I could have got to. In a weird way, the MS actually gave me a bit of a second chance I guess, which is odd isn’t it? It is odd, but I think you don’t give yourself enough credit because there are people that get diagnosed with these things and live with these things and they… I don’t want to… Some of them just spend the rest of their lives feeling sorry for themselves. Oh, I know, don’t get me wrong. My mother has got MS as well, and she, unfortunately, is one of those. She took herself into a wheelchair and she is now waiting to die. That’s it. That’s her, that’s how she is. She’s very much like that. That’s the end of her story if you like, as far as she was concerned. I do meet people like that, but on the whole, I am really lucky and I’ve met a lot of people that are completely the opposite. You know that really awful thing where you always go, I say this to John now, my partner who’s got Parkinson’s, “Do you know what John, there’s always somebody worse off than you.” Which is an awful thing to say, but sometimes it can give you that little bit of a lift, in a kind of weird, sick way really, to be perfectly honest, but there is always someone much worse off. So I think now “Well do you know what, I’m actually really lucky. Exactly. Do you know I said that to somebody…? I know it’s really strange but that’s what I think. My parents are alive, my friends and family are still alive. I said that to a client, at the weekend. Hopefully, you’re not going to build on the negatives; you’re going to build on the positive. That’s how I live life. No, I completely agree and I think sometimes as well, I think we are so privileged in the country that we live in, and the place that we live in, and all we’ve got to do is watch some of the adverts for people in third world countries to realise how privileged and lucky we are to have everything that we have. Oh, I know. I’ve just been torturing myself watching something, somebody sent me a link about Syria, and I’ve just been torturing myself about that. I don’t know. Maybe it’s because I’m British and I feel I need to. I don’t know. Actually, when I look at things like that, I then come back into the real world. Gosh, we are very, very lucky. Even more so lucky if we’re lucky enough to be able to do the thing we love, which is ride, judge, teach, whatever it is. How lucky are we? God, do you want that one? That’s fluke as well. Nothing about me is horsey. Nothing. Nothing about me is horsey. How did I get into horses? Really, I’ll give you the quick answer; I had a very good friend at school, we grew up together in Jersey, birthday parties, all that kind of thing. We were quite near to each other in birthdays and her mother one day said, “Oh I’m going to buy Alison some riding lessons, do you think Simon would like to come along?” My mother went “Oh what a jolly good idea. Let’s do that.” Bearing in mind, half-an-hour was £5, no it wasn’t, sorry that’s a lie. An hour was 5 pounds, for half-an-hour it was £2.50. We went along and had lessons. My friend, Alison, fell off on the first lesson, refused to get back on. We were eight, eight I think, seven or eight, she refused to get back on, I absolutely loved it. In fact, my mother ended up buying the other five lessons from Alison’s mum, and I had those and carried on from there, and six weeks later, or a little bit longer than that, eight weeks, a couple of months, my grandmother bought me my first pony because I was a very spoilt child. Not that we had loads of money, but I was the only child, I was the only grandchild at the time, so I was hideously spoilt, I guess. I had my first pony, which cost £110, shipped and vetted, from Wales to Jersey. Other than that, the only connection I’ve got to horses is, I believe, my great-grandfather had a horse-drawn milk float, and the horse was called Penny. A little bit different to dressage though isn’t it? Yes, and again once I got into horses, dressage was absolutely a by-product, because I literally, I wasn’t lying; up until 2005, when I started competing doing dressage, up until that time I can honestly say I’d ridden 20 dressage tests, that was it. The rest of the time I was into show jumping and doing a bit of cross country and spending a lot of time on the floor, looking up at the poles and things. When did you actually make that decision? 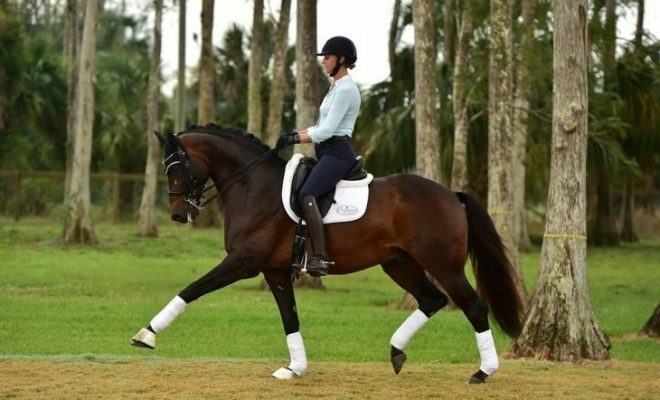 When did you actually say, “I want to be a professional dressage rider” and how did you make that journey? How did it happen? How did you get to the Paralympic Games? How did you win a gold and a silver in Beijing? How did that happen? Oh my God. How did that happen? Okay. I got diagnosed in 2005, with MS. That was in November I got diagnosed. In the June my partner, of the same year got diagnosed with Parkinson’s, and we’d only met six weeks before we got diagnosed. That’s a book in itself, isn’t it? Anyway, so from there, the consultant sort of told me that me riding, or jumping – which was my first love – shouldn’t be happening and I should be more sensible. Bearing in mind, doing point-to-point and stuff and cross country, that I’d already broken my pelvis a couple of times and broken pretty much most bones known to man; ribs, shoulders, everything else. Had a little tinker around at that, and then I had borrowed John’s horse, my partner’s horse, he’s not horsey, it’s the horse I taught him to ride on. I borrowed that, did a few Prelims and a few Novices in Jersey and by complete fluke, we had a competition in Jersey called Oaklands, which is quite a big competition there, run by the Spinnel family and one of the judges happened to be, at the time, one of the selectors for the Para squad, a lady called Chris Porterfield. She spoke to a couple of people who said “Oh yes…” Because I did suffer from a lot of tremors back then, and she’d asked a few people, “What’s wrong with him? Was he drunk?” No, I wish I had been drunk, but I wasn’t. When she got back to England she phoned me and said, “Look, have you considered doing Para-dressage?” I’ll be really honest; I hadn’t really heard of it. I’d heard of Lee Pearson, and maybe Anne Dunham possibly, but as far as I was concerned, Para-dressage was a little bit, no disrespect because I am involved with it anyway now, a little bit like being led around a field, everyone’s stereotype of a shaggy pony. I stopped working for a year, which I was very, very lucky and I went for it. I had already known Henrietta and Ulrich from Gemma and I was with another trainer before that, which didn’t really work out. Anyway, so I ended up being asked if I’d go to Germany to compete, and then my horse broke and they told me I needed a new horse. I’d wanted to get a new horse anyway, and we went off and we bought my little black horse. Again, really lucky, but I mean in the grand scheme of things, I won’t say how much he was, he was not expensive. Then Henrietta came along, she came on board and she was absolutely brilliant because she didn’t really know anything about Para, at all, so she threw herself into it completely. I mean that in itself was a weird kind of scenario because I’d known her for a very long time. I went to Germany, the horse went, my trainer, I can say this now- I don’t care really to be honest- she never turned up to go to Germany. She never turned up at the airport. We got a flight for her, she arrived, she knew nothing about it, but obviously, she knew, luckily for me, I guess, she knew Michel Assouline who was our team coach at the time. That’s what I love about Henrietta; she absolutely says it like it is. Absolutely like it is. There’s never any malice, she just went, “It’s not very good.” She wasn’t wrong. Anyway, the next 48 hours, she was an absolute gem. I didn’t have any music, no music at all, because that was with my other trainer. So Henrietta and John, on the laptop, literally burnt off a CD overnight. She put together a floor plan; I literally never rode the floor plan, I just looked at it with Henrietta on the piece of paper and I came second. I have no idea how, to this day I have no idea how, but I did. I’m sat, just literally… That is a great story! Honestly, my life has been like a complete rollercoaster. With all these different, kind of, weird and wonderful things. Then it snowballed from there. I thought, “Oh yes, right, okay. Whatever.” I think my horse was great. I said “Look, I’ll be really, really honest with you Jane” this sounds really awful as well, there are two squads – so there’s the performance squad and then there’s the start and potential squad. Normally what happens is the performance squad is where the teams come from and the start and potentials are those that are training and getting going and will take over from the old duffers like us. She went away and she spoke to the powers that be and next thing I was routed onto the performance squad. I went to the World Championships where I won a gold and a silver. Then the following year I went to the Games, got a gold and silver there and then the following year I went to the Europeans and I won two bronze and a gold, and then I retired. You also won Disability Sports Personality of the Year according to Wikipedia here. I did. Yes. I’m even in Dubrets. How did that happen? My grandmother would be absolutely doing backflips, she’d love that. The thought that one of her grandchildren was in Dubrets she’d absolutely love it. That’s fantastic. That’s such a great story, Simon. It’s a little bit like, I don’t think you could write it. I don’t think nobody could write it and make this up. It’s about to be a book. Oh, is it? Oh, that would be fantastic. Are you writing your autobiography and everything? I think that is a fantastic story. It is just a very ordinary story, because if somebody asked me, what would you say to someone, it would be, do you know what, if you want to do it, you can do anything you like. 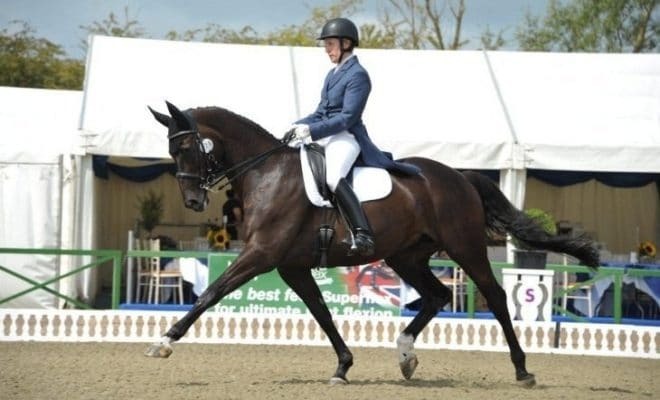 It doesn’t matter whether you’re doing walk-trot, novice or Prix St-George. Whatever you want to do, you can do it, as long as you do it as good as you can possibly do it and try to be the best you can possibly be. It doesn’t matter whether you’re on a cob or a flashy thing, you just try and make that the best it can possibly be and if you achieve those things, in my book, you’ve made it. Oh, that’s brilliant. I’m actually really excited for your book because I don’t think anybody could actually make up that story that you just told me. No, that’s right. That’s what my clients say to me, “Do you know what, this is impossible, there is no way…” they read my Facebook posts as well, because I write the most ridiculous things on Facebook because my life is an open book. It sounds as though you’ve had one rollercoaster ride. I’ve had an amazing life so far. I don’t regret anything. There are a few things that I probably shouldn’t have done, but hey, haven’t we all done slightly crazy things? Oh, I think we all have; I think we’ve all got enough skeletons in closets somewhere, haven’t we? I think you’re the first people that have ever heard, apart from British Dressage, the cage dancing story. Do you know what it does? It makes you normal. It makes you approachable, it makes you like a real person. The illusion you have of somebody at the top of their tree is that they are this unapproachable person on a pedestal, or if they’ve got, like yourself, you had the pole dancing studio and I did the cage dancing, I was never ashamed of it. I never took my clothes off, ever. I mean it was a very small pair of shorts, I will admit, but I was covered. I was never ashamed of it because back in the ’80s, three nights a week, I was making 800 quid. That was a lot of money. I wasn’t doing anything wrong. I had a great time. I met some amazing people and I wouldn’t be doing this now and it wouldn’t be me! I mean, I’m the same, I’ve got some fantastic friends from those days, as well and it helped fund my following businesses. I could talk to you all day Simon. I’m trying to get through these questions. I keep going off on these little tangents with you. What’s the biggest mistake, or maybe the worst thing that’s ever happened to you in a dressage test? That’s a good one. You’ll like this one. This is at the European Championship, in Norway. It was the last big Championship that I did. Jane Goldsmith was there, she is key to this story. I rode, and things had started to go really badly for us, John had been made redundant, we got caught in the credit crunch, things were going really bad and that happened during the Games. It all kicked off. I really wanted to have the full set, this sounds really awful, of medals. I really wanted it. We kept the black horse and did the Europeans and in my mind, I have to be really honest, they took me on the team because I had been winning a lot, but my mind really wasn’t on the game. I went there and was literally, this is not a lie, and Henrietta will bear me out on this, I went there with £100 to my name, and that was to last the entire week. Bearing in mind I was the one on the squad; trust me when I say I can spend money. I can really spend money. Really spend it. Going there with just 100 quid in cash on me, that was it. No credit cards, nothing. I had my horse, job done. I went there and the first test, my horse was absolutely amazing. Henrietta flew over and helped me with him and he was brilliant. I halted at X and then I realised, that the halt was a G.
That was five judges, so minus 2 from each judge, so that was 10. I lost the gold medal by eight marks. I went “Do you know what Sophie; it was absolutely fantastic.” Which wasn’t a lie, she didn’t know how crap I’d done. Of course, she did, she won gold. My mind wasn’t really in the right place, I guess, was the point. You do need to be quite focused on what you’re doing. I think, possibly, I was a little bit off my A game. Needless to say, that was a disaster as well. That was a disaster, that was the music, that was a complete and absolute fiasco, from start to finish. As we said earlier, nobody died. No, exactly, nobody died, and I walked away, unscathed, and I still won a medal, I still won bronze. It wasn’t really a biggy, was it? We go wrong. End of. Our minds go blank. We’ve all been in that moment and if any rider says they haven’t, they’re lying, and if anybody who trains and teaches or judges and has ridden, and said they haven’t been in that moment, they’re lying again. I’m sorry because we all have been in that moment, where “Oh my God, do I turn left, do I turn right, is it a circle, is it 10 metres, is it 15 metres?” Do you know, it happens. It’s just how it is I’m afraid. We are not infallible. We are human. We make mistakes, we make errors. But that was my worst one. That cost me quite a lot I guess. That error of call. Do you ever look at your medals and think that there should be another? I do, but do you want to know another really weird thing about me? Do you know where my medals are? Am I meant to guess? Do you want me to…? Have a guess, okay. I would think maybe in your living room or in your bedroom? Are they in your house? Can I do like a yes, no game? Are they in your house anywhere? They are in my house. They are in your house. Are they top floor? I know you’ve got… Are they third floor, second floor, ground floor? Ground floor. Well, we’ve got a basement as well, but they’re on the ground floor. They’re on the ground floor. Kitchen, oh yes, you’re getting warm. Kitchen, we’re warm in the kitchen. They’re not at the back of a cupboard or something are they? They are under the sink in a Tupperware box. Strange place to put them. I know. I told you I was strange. Do you want to know why they are there? As far as I’m concerned, they are just a by-product of something I’m very proud of. Don’t get me wrong, I’m very proud of my medals, I’m very proud of what I’ve done, but they are just a by-product. They do not make me. They do not define me. It was doing something I loved to start with. Never in my wildest dreams did I think I would be trotting around an arena in the middle of Hong Kong, under all the blooming neon lights and things, doing the up-downs. I never thought that was going to happen. They’re not really desperately important. The memories are really important. The people I’ve met are really important. The fact that I’ve represented my country is really important; the medals themselves, when I go off to schools and things, my medals must be the most chipped, battered medals in history. I’ve had kids drag them around the playground, and do what they like with them because for a kid to touch a medal, anybody to touch a medal, it’s quite something and they need to be used. They are not there as just bloody ornaments. Not for me anyway. That’s how I am. If you came to my house, there’s nothing horsey about my house. I have one painting of a horse and that’s it. I imagined, I don’t know if this is quite stereotypical of me, but I imagined of a successful dressage rider, going in and seeing a wall of rosettes or pictures of them. …I would literally go into meltdown. Think of the dust! Okay, that is true. They do collect some dust rosettes, don’t they? Rosettes. I did that when I was a little kid. My grandmother had my wall, which had all my rosettes on. There is one painting, a really lovely Carley Martin painting that I’ve got, quite abstract and I’m not in it, my head is cut off, I deliberately wanted my head cut off. You can see it’s me and you can see it’s my horse. Actually, I’m telling a slight lie, there is one picture here, and I’m actually looking at it weirdly now, which John has obviously got up in his office, because that’s where I am, and it’s of me winning my first national title, in 2007. That’s it. John sounds as though he’s been such a great influence on you. On everything. He’s just kept me going. He’s always been there for you, hasn’t he? He is absolutely the thing that’s kept me going and even when things were absolutely hideous and we were technically bankrupt; he lost his job, there was no way he was going to get another job, not with Parkinson’s, he was ill, everything else that was going on, he never uttered a word to me. 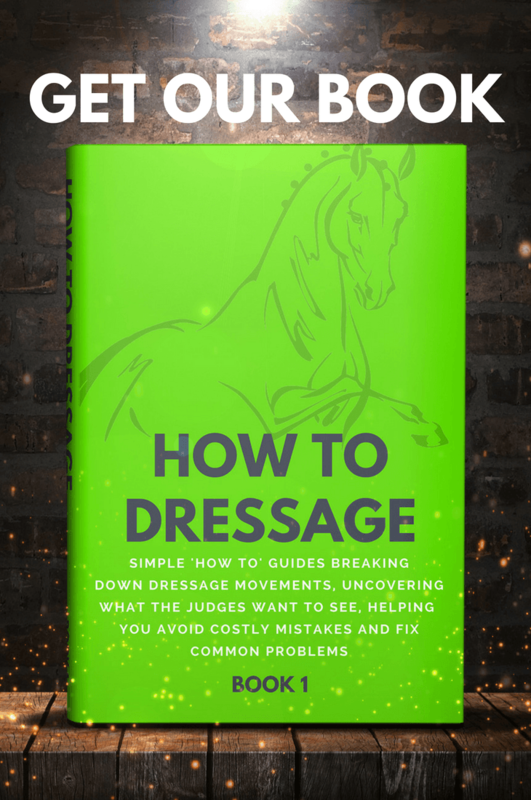 So, one last question for you Simon, before we wrap up, if you could give one top tip to all the riders listening – and this can be a training tip, or it can be a life tip, or a single piece of advice for all the aspiring dressage riders out there – what would it be? For all the aspiring dressage riders out there, well, I guess the overriding thing is, is if you really want to do something, it doesn’t matter how good or bad you are at it, you can only get better. By going out and competing and doing, you will get better, and just try and be as good as you can possibly be. You don’t have to be a superstar, not everybody is going to win a medal, and I actually applaud those that just want to go out and enjoy their horses. Enjoy it. 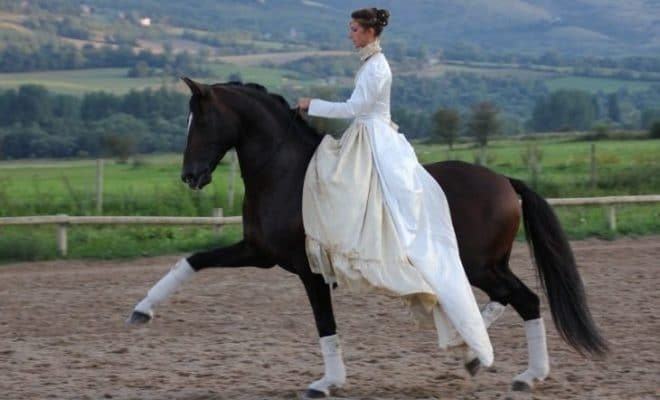 Enjoy dressage. It is meant to be fun. It’s not torture, allegedly. It is meant to be fun. Have fun with it. Have fun. That is my biggest thing. Enjoy it. Enjoy your horse. Awesome. What’s the best way for people to connect with you Simon? Do you have a Facebook, a Twitter page or website or anything people can follow you? Facebook. Everyone finds me on Facebook. Anyone can find me on Facebook. Just look me up. Fantastic. I really enjoyed interviewing today. Really, really enjoyed it. Thank you very much. I enjoyed it, it was good. It was good, you’ve had some snippets that nobody else has had, I can assure you.